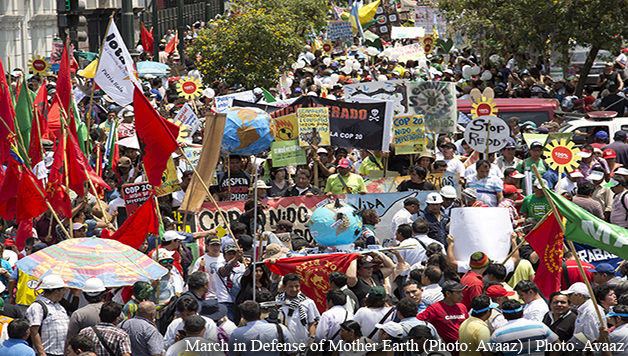 Protesters march in response to COP20 in Lima. Paris Climate Summit: Save Our Planet From Capitalism! From November 29 to December 12, world leaders will gather in Paris for the 21st UN Conference on Climate Change, or Conference of the Parties (COP 21). The gathering has the objective of achieving a legally binding and universal agreement on climate policy to replace the expired Kyoto Protocol and, for the first time, to include all nations – in particular the U.S., which never ratified the Kyoto Protocol. But environmental activists are understandably skeptical. Over the past twenty years, international climate talks of this sort have become an empty ritual, allowing world governments to flaunt their environmental credentials without accomplishing any practical results. In particular, the Paris talks come in the aftermath of the Copenhagen fiasco of 2009. The COP 15 talks in Copenhagen made similar promises to achieve a legally binding treaty. But the talks fell into disarray. Despite its lofty aims, there’s little to convince most environmentalists that Paris will be anything other than Copenhagen II. The failure of capitalist leaders everywhere to effectively tackle global warming and other environmental problems is an expression of the underlying contradictions of capitalism. Scientists have warned time and again that urgent action is needed to take on climate change. They have calculated our “atmospheric carbon budget,” how much fossil fuel we can burn and limit the total warming to just two degrees. The calculations indicate that we have roughly 30 years left, at current rates of carbon emissions, to transition to renewables and adapt to the changes already underway. Regardless of the outcome of the Paris talks, we cannot rely on the capitalist world leaders to solve the climate crisis. That task is up to us. The failed climate talks in Kyoto, Copenhagen, and Paris are only one side of the fight against climate change. On the other side are mass movements against the Keystone XL pipeline, against fracking, and against the destruction of indigenous communities by the encroachment of big business. The battle to stop Keystone XL, which has delayed the construction for four years and forced TransCanada to rescind its proposal, shows the effectiveness of mass resistance. From soaring temperatures to big agriculture’s farming techniques – stripping the soils of vital nutrients and threatening our ability to feed ourselves – capitalism is driving society back into barbarism. A profit-based economy is not capable of rapidly transitioning away from fossil fuels. On the contrary, it’s hell-bent on squeezing every last drop of cheap fuel from the Earth. The only way forward for humanity, to secure an ecologically balanced future, is to bring the economy into the hands of working people and democratically map out a production plan that begins to slow global warming, dramatically reduce pollution and toxic chemicals, and lessen the intensity by which we interact with the natural world, all while working to raise living standards globally. Socialist ideas have been gaining in popularity. And among environmental activists, system change is gaining support as the guiding aim of struggle. By building these environmental protests into a sustained and organized mass movement, we can make that change happen. Left in the hands of the capitalist world leaders gathering for COP 21, the prospects are far gloomier.